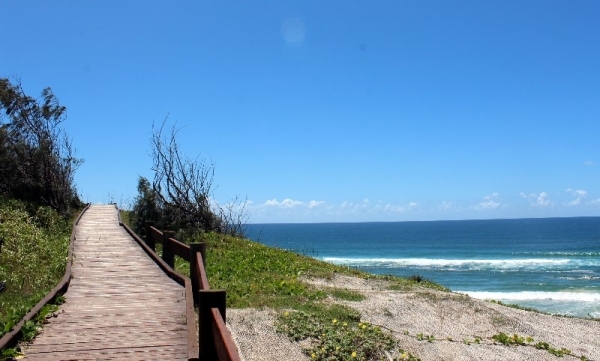 The best way to prepare for your trip to Fraser Island is to look ahead at the weather forecast. Though Fraser Island enjoys a relatively tropical climate all year round, it is important to know what to expect temperature wise, so you can enjoy the most of your daily adventures and tours while on Fraser. The summer months (December, January, February) mean the warmest weather, are are usually the wettest part of the year, with humid days and plenty of sunshine. If you're travelling in this time of year, it's a good idea to bring wet weather gear and bug spray, as well as a swimsuit! There are plenty of places to swim on Fraser Island during the hot summer days, meaning you will be able to cool down and relax on one or two of your stops on the island. Autumn (March, April, May) is a comfortable time of the year to visit Fraser as the days as less humid and the nights are a pleasantly cool temperature. If you are travelling in March there still might be consistent rainfall, so it's still a good idea to pay a light water proof jacket. Winter (June, July, August) are the coldest months and have less rain, but also align with whale season, which is an amazing time to visit Fraser Island as many whales migrate past the Fraser Coast. If you're travelling in this time of year, be sure to pack warm clothing for the cool evenings and keep an eye out for our annual visitors when you are near the coast. Spring (September, October, November) on Fraser Island will see the temperatures increase again leading up to the summer months. However, it can still be cool in the evenings, so pack a light jumper to keep you warm. No matter what time of the year you travel to the stunning Fraser Island, you are sure to enjoy everything it has to offer. Its attractions such as Lake McKenzie, Lake Wabby, Eli Creek and Indian Head are equally stunning all times of the year, making it a go-to when making your way up or down the coast. See current weather conditions of Fraser Island.